The Easter Season begins on Easter Day and lasts fifty days, ending at Pentecost. It is a 'moveable feast' because the date of it is fixed according to the moon - it can fall on or between 21 March and 25 April. The first week of the Easter Season is known as Easter Week. Easter also marks the end of Lent, a season of fasting, prayer, and penance. It is the oldest and the most important Christian festival celebrating the life, death and resurrection of Jesus Christ. The church colour for season of Easter is white (or gold) and represents the light, joy and purity of Christ. 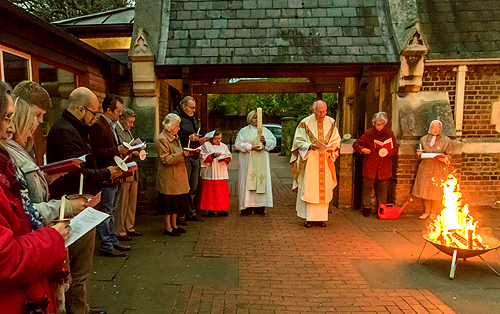 The Easter Vigil, the Sunrise Service (celebration of light), is held in the hours of darkness between sunset on Holy Saturday (the day before Easter Day) and sunrise on Easter Day and at St James's, at dawn on Easter Day. An open fire is lit and blessed by the priest and when the Paschal candle is lit, the people ceremoniously enter the dark church. 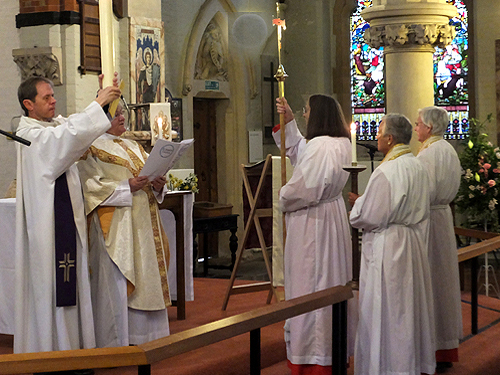 Three times ‘The light of Christ’ is proclaimed. The Easter Candle is placed in its stand in a prominent position in the church. So the first part of the service sees us pass over from darkness to light as this was the day of resurrection. Secondly, with just enough light to see, there are several readings from the Old Testament pointing to God’s loving purposes which find their fullest expression in the resurrection. In the light of Easter, we pass over from the old to the new. Third, the waiting was over, and the resurrection is proclaimed. All the lights in the church are put on, and all candles lit. The account of Jesus’ resurrection is read. 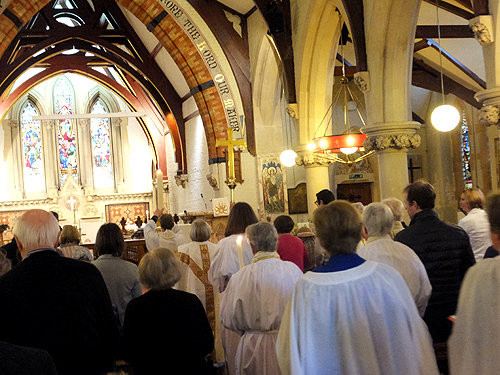 Just as the readings hinted at the ancient practice of a long vigil so also does what follows as the congregation renew their baptismal vows. We celebrate the passing over of Christ from death to life, and the reality of this for each person present. The large wax candle which is lit during the Easter Vigil is called the Easter Candle. This candle is also known as the 'Paschal' Candle from the Hebrew pesach meaning 'passover'. The Easter Candle is the principal symbol of the resurrection during the season of Easter. It is the sign of Christ's 'passover' from death to life. Usually the candle has specific decorations on it, a transfer in plastic or wax of a cross with the date of the year and the letters 'alpha and omega' (the first and last letters of the Greek alphabet) and five pins or nails. During the Easter Liturgy the cross on the candle, the symbol of salvation, is traced by the presiding priest. Then the alpha and omega, for Christ is the beginning and end of all things. Then the year is traced, for it is in our own time that Christ is alive and present. The priest says: "Christ yesterday and today, the beginning and the end, alpha and omega. All time belongs to him, and all ages; to him be glory and power, through every age and for ever. Amen." Then the five pins or nails are put in, reminding us of the five wounds of Christ. The Gospel of John records how the risen Christ still had his wounds. The priest says: "By his holy and glorious wounds may Christ our Lord guard us and keep us." The Easter Eucharist is held at 9.30 on Easter Sunday and is a particularly joyful service. All the resources of the church are used to celebrate Christ’s resurrection - music, flowers, bells, colour. Easter hymns use the word ‘alleluia’ (a word not used at all in worship during Lent) with great frequency. 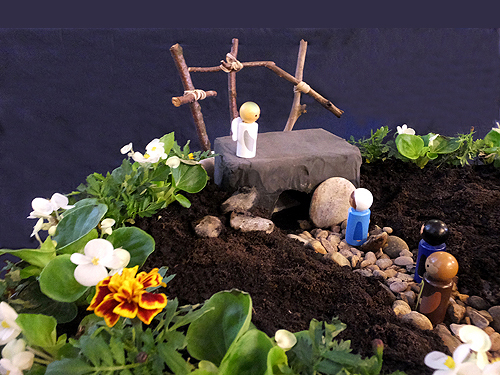 St James's, like other churches, makes an Easter Garden, recreating in miniature the place where Jesus was buried. This adds to the beautiful decorations in the church for this most important and significant festival. A stone is placed across the mouth of a tomb before Easter, then rolled away on Easter morning, leaving an empty tomb. Easter eggs symbolise new life and at St James's there is a basket of eggs or Easter Egg hunts for the children after the service. As Easter is not just one day, but a season, the Easter Candle burns at all celebrations of the Eucharist from Easter Day right through until the day of Pentecost, at the very end of the Easter season. It is the principal symbol of the resurrection during the Easter season. After the celebration of the Eucharist at Pentecost, the Easter Candle is placed near the font in the baptistry. It is then lit again at services which point people to new life in Christ - baptisms and funerals. Jesus had told his disciples before he was arrested that he would be crucified and on the third day he would rise from the dead. On the first Good Friday Jesus was crucified and after he died his body was removed from the cross, wrapped in linen and buried in a tomb. A large heavy stone was rolled in front of the entrance and the guards kept watch to ensure that no-one could steal the body. At dawn, three days later, several women visited the grave only to discover that the stone had been rolled away and the tomb was empty. Jesus himself was seen that day, and for some days afterwards by different people and his followers realised that Jesus had risen from the dead.